More often than not guests are so focused on finding the Big 5 that they tend to overlook the more common animals and amazing birdlife we have in South Africa. Recently we had a group of keen birders visit the lodge. After enjoying some great sightings of the larger species, we set off in search of some of our feathered friends. In a relatively short space of time we managed to tick a fair number of them off our list. 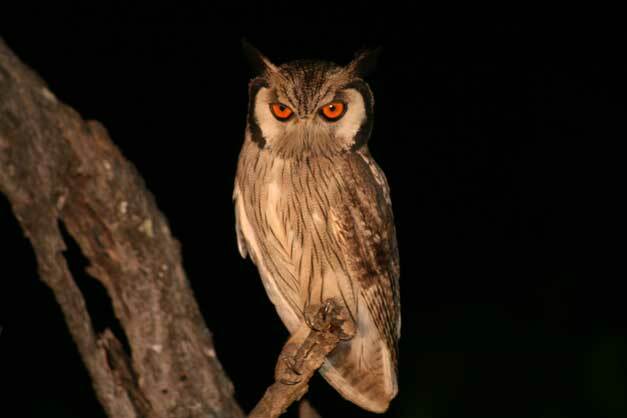 We were on our way back to the lodge later that evening when we found a beautiful Southern White-Faced Scops-Owl sitting on a branch right next to the road. While these owls are fairly common in this area, it was quite extraordinary to see one so close to the road. We sat and watched the owl for a while and it soon became accustomed to the fact that it had an audience, so much so that it even started chasing some of the insects attracted by our spotlight. When the owl had eaten its fill it returned to its original perch in the tree next to the road. Watching the owl gorge itself on all the insects reminded us that dinner was waiting for us back at the lodge, so we headed off to see what gastronomic delights the camp’s talented chefs had whipped up for us.